Promising Educator Nominees: Alexis Chandler, Wiliam Poore, Victoria Walsh and Charles Thai. 2018 Promising Educator winner Victoria Walsh. Ms. Walsh teaches Special Education at Galena Elementary School. 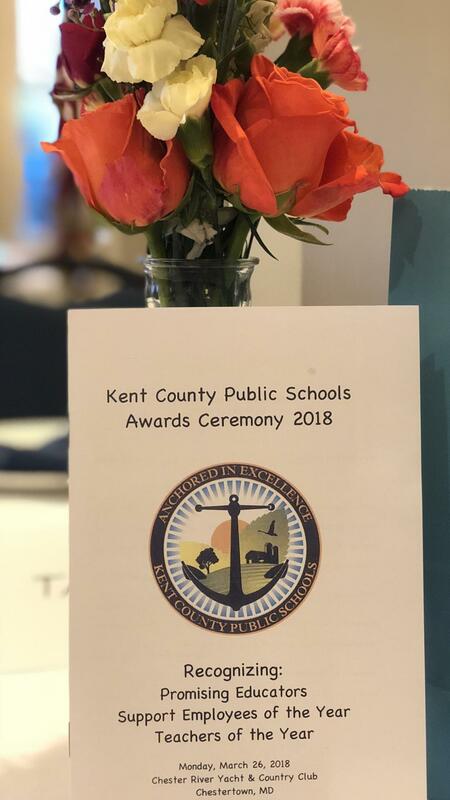 Support Employee of the Year Nominees: Barbara Jones - KCHS, Carol Hoxter - KCMS, Faith Amirikian - GALES, Anesha Freeman - HHGES, Terrence Moody - RHES, and Hannah Kelley - Administrative Offices. 2018 Support Employee of the Year Anesha Freeman. Ms. Freeman is an Instructional Assistant at H.H. Garnet Elementary School. Teacher of the Year Nominees Noel Morris - KCHS, Amelia Markosian - KCMS, Linda Taylor - GALES, Jennifer Maloney - HHGES and Christine Austin - RHES. 2018 Teacher of the Year winner Amelia Markosian. Ms. Markosian is a science teacher at Kent County Middle School. Pictured here with KCPS Board Member Joseph Goetz, Vice-President Bryan Williams, President Trish McGee and Board Member Wendy Costa. Pictured left to right: KCPS Superintendent Karen Couch, Promising Educator Victoria Walsh, Teacher of the Year Amelia Markosian, Support Employee of the Year Anesha Freeman and Kent County Commissioner Bill Short.